... where the polluters tread, 'Green' is dead. ... and the air stunk. It was hard to breathe. It was a familiar smell to me -- a Paper Mill STENCH. I remember that smell from my undergraduate years at Penn State (State College, PA) in the unenlightened 60s, when we could smoke in the classroom (and I often did), and where we were often downwind of the Johnstown paper mills, and assaulted by that acrid smell. So here, finally, I've made my response. Take it or leave it. I had fun putting it together. Okay, end of soapbox, and back to talking about hiking. The essay photos were taken on GA 20 on part of a twenty mile road walk to and through Cave Spring that I embarked on today after walking the southern half of Taylor's Ridge on footpath yesterday, then walking the Simms Mountain Rail Trail where I met up with the Great Eastern Trail. A bit more on the Great Eastern Trail in a moment. First back to the discussion of GA 20. Environmental views aside, this is a busy four land divided highway and like most 20th century American highways it had no accommodations for pedestrians . . . until just now. As I passed, workers were pouring concrete sidewalks as part of a new Rome, GA bypass highway interchange. I found myself wanting to scratch a Pinhoti logo into the freshly poured concrete, but I settled for a more temporary mark instead. so I walked the latter. It has a nice wide shoulder, so the high speed traffic didn't feel threatening. The true story behind my trail name is summarized on this shirt. Actually this also has the potential for a deep and opinionated essay on my philosophy, but I'll hold that for later. Now, as promised, a bit about the Great Eastern Trail. Where the southbound Pinhoti Trail joins the Simms Mountain Rail Trail, it also meets the Great Eastern Trail. Here's the first of their trail markers that I saw, right at the intersection. From here on south I'll be following the GET. 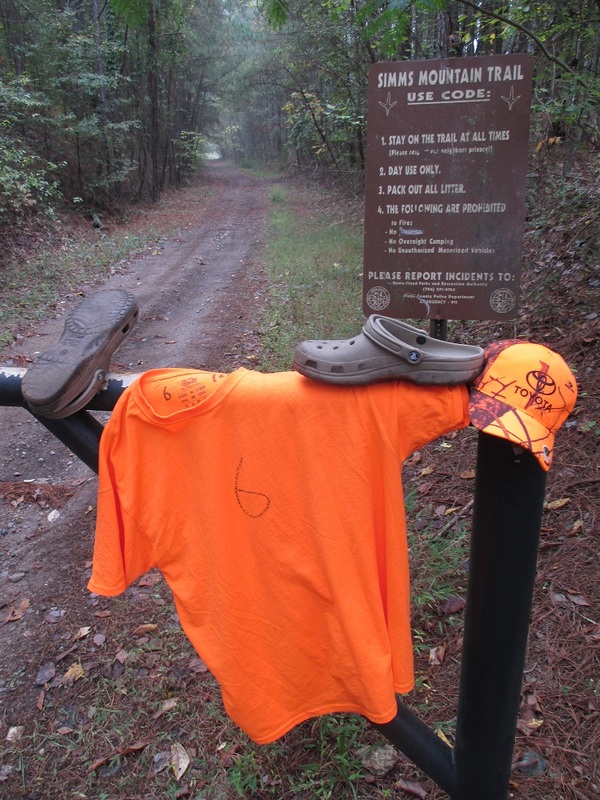 It continues beyond the southern terminus of the Pinhoti and provides a temporary road walk connection through the southern half of Alabama to the Florida Trail, then it coincides with the FT for its entire length. So this was a bit of a landmark day. Weather was perfect - sunny and mild after the morning's stenchy fog. And the forecast is for the great fall weather to continue for at least a week. Lets hope the weatherman is right. Below is a map of the two days of hiking, totaling about 34 miles. Follow the link for many more photos.